How do Insects Survive our New England Winters? By Chris Williams on November 27, 2014. Think insects can’t survive this? Think again. If you’re thinking that one good thing about a cold winter is that it will kill a bunch of pesky insects, sorry to disappoint. 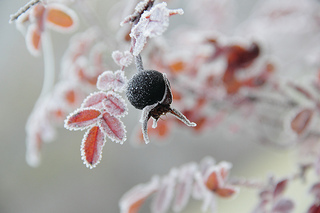 Insects can survive almost anything and they are well adapted to deal with a little cold. Because insects are cold-blooded and don’t generate heat, they must either be able to tolerate freezing or they must use strategies to avoid temperature extremes. Some have a sort of antifreeze present in their bodies that allows 50% or more of their body water to turn into ice without harm. They enter a period of icy inactivity during freezing temperatures, only to thaw out and become active again in the spring. Some pests, like Japanese beetles, spend the winter well insulated underground. During summer, the beetle grubs feed on grass roots in the soil. In the fall, the grubs migrate to deeper and warmer soil to spend the winter. Even when outside air temperatures are below zero, soil temperatures are considerably warmer, probably above freezing. And a layer of snow actually serves as an insulator to further hold heat in the soil. Not to say that insects don’t die during prolonged periods of cold, but what is more likely to do them in is a sudden change in conditions. If insects have enough time to gradually adapt to extended cold, they’re fine. But they’re not always able to deal with sudden freezing-thawing cycles which can expand and rupture their body cells. Not all insects survive until the first cold weather. Some, like yellowjackets, that have only one generation a year, are destined to die in the fall. Only a few reproductive members are left behind to spend the winter and start a new colony in the spring. Other insects die after laying eggs that will survive the winter and then hatch in the spring. Some insects migrate to more temperate regions to avoid cold, while others seek winter shelter in warmer, protected places…like your home. Then there are those lucky insects such as cockroaches, fleas, spiders, and bed bugs that live indoors with us year round and never have to face cold weather. Let us keep them warm, for without them we’d be out of business!